Do you enjoy listening to Christian music? Do Christian songs make you feel more relaxed and calm? If yes, then you are on the right place, because “Christian Music Ringtones Free” app offers you the very best of the songs of worship! This is a high-quality app which enables you to have the best Christian music on your phone. Once you download the application, you can enjoy these beautiful songs whenever you want and for how long you like! The best thing is that this app is completely free! If you don’t like this kind of music, with Christian Music Ringtones Free app you will fall in love with it most definitely. The variety of choices this app offers is enormous. 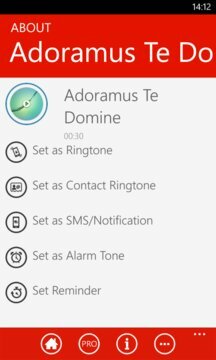 You can put Ave Maria as your ringtone or Sanctus song and in that way have the coolest ringtone among your friends. You can pray for your loved ones while listening to Dies Irae or Salve Regina. 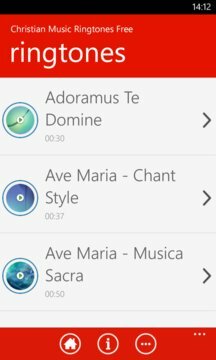 This app is also convenient because you have all the lyrics available with songs so when in church catholic prayers are read, and Gregorian chant is sang you can follow it without problems. You can play these praise songs to your friends and educate them and this is also a great way to start conversations with people in sharing the gospel. "Set as Alarm" command will not affect existing alarms, only the new ones you create. You can delete existing alarm and create new one. Sound clips used in Christian Music Ringtones Free Windows app are under public domain license and/or Creative Commons’ license.